With a Python script, a length of wire attached to the TX pin, and a mastery of the electron that we mere mortals can only hope to achieve, [Ted] has demonstrated using a common USB to serial adapter as an SDR transmitter. That’s right, using the cheap little UART adapter you’ve almost certainly got sitting in your parts bin right now and his software, you can transmit in the low megahertz frequencies and even up into VHF with some trickery. The project is still very much experimental, and though this may be the first time, we’re willing to bet this isn’t the last time you’ll be hearing about it. 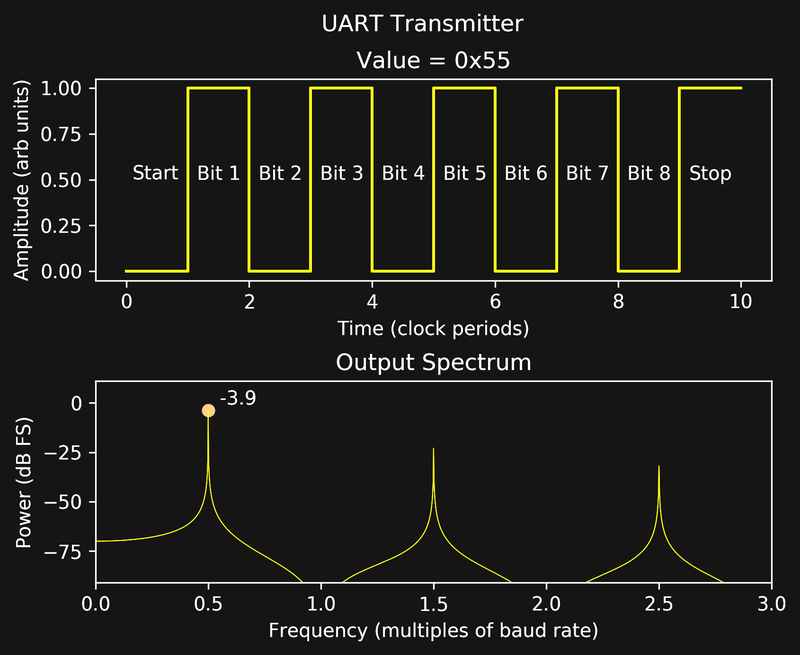 The basic idea is that when sending certain characters over the UART serial line, they can combine with the start and stop bits to produce a square wave burst at half the baud rate. [Ted] found that sending a string of 0x55 at 19200 baud would generate a continuous square wave at 9600 Hz, and if he turned the baud rate all the way up to 2,000,000 where these USB adapters top out, that signal was transmitted at 1 MHz, right in the middle of the AM dial. A neat trick to be sure, but alone not terribly useful. The next step was to modulate that signal by sending different characters over UART. [Ted] explains at great length his experiments with multi-level quantization and delta-sigma schemes, and each step of the way shows the improvement of the transmitted audio signal. Ultimately he comes up with a modulation scheme that produces a impressively clean signal, all things considered. This alone is impressive, but [Ted] isn’t done yet. He realized that this method of transmission was generating some strong frequency harmonics which extended far beyond the theoretical maximum 1 MHz frequency of his UART SDR. In his experimentation he found he was able to pick up a signal from all the way out to 151 MHz, though it was too poor to be of any practical use. Dialing back the expectations a bit, he was able to successfully control a cheap 27 MHz RC toy using the 43rd harmonic of a 631 kHz signal at a range of about 10 feet with a FT232RL adapter, which he notes produces the cleanest signals in his testing. [Ted] is still working on making transmissions cleaner and stronger by adding filters and amplifiers, but these early accomplishments are already very promising. His work reminds us of a low frequency version of the USB to VGA adapter turned GHz SDR transmitter, and we’re very eager to see where it goes from here. After a couple of millennia of fiddling with gears, you’d think there wouldn’t be much new ground to explore in the field of power transmission. And then you see something like an infinitely variable transmission built from nested pulleys, and you realize there’s always room for improvement. The electric motors generally used in robotics can be extremely efficient, often topping 90% efficiency at high speed and low torque. Slap on a traditional fixed-ratio gearbox, or change the input speed, and efficiency is lost. An infinitely variable transmission, like [Alexander Kernbaum]’s cleverly named Inception Drive, allows the motor to stay at peak efficiency while smoothly changing the gear ratio through a wide range. The mechanism takes a bit of thought to fully grok, but it basically uses a pair of split pulleys with variable spacing. The input shaft rotates the inner pulley eccentrically, which effectively “walks” a wide V-belt around a fixed outer pulley. This drives the inner pulley at a ratio depending on the spacing of the pulley halves; the transmission can shift smoothly from forward to reverse and even keep itself in neutral. The video below will help you get your head around it. We’ve seen a couple of innovative transmissions around here lately; some, like this strain-wave gear and this planetary gearbox, are amenable to 3D printing. Looks like the Inception Drive could be printed too. Hackers, start your printers and see what this drive can do. Stepper motors are a staple in all sorts of projects, but it’s often the case that a gearbox is needed, especially for applications like the linear drives in CNC machines and 3D printers. In those mechanisms, a high-torque, low backlash gearbox might be just the thing, and a 3D printable split planetary harmonic drive for the popular NEMA 17 motors would be even better. Right up front, we’ll say that we’re skeptical that any plastic gearbox can stay as backlash free as [SirekSBurom] claims his creation is. But we can see the benefits of the design, and it has some nice features. First off, of course, is that it’s entirely 3D printed, except for a few screws. That it mates perfectly with a NEMA 17 motor is a really nice feature, too, and with the design up on Thingiverse it shouldn’t be too tough to scale it up and down accordingly. The videos below show you the theory: the stepper drives a sun gear with two planet gears orbiting, each of which engages a fixed ring of 56 teeth, and an output ring of 58 teeth. Each revolution of the planets around the fixed ring rotates the output ring by one tooth, leading to almost 100:1 reduction. We think the ‘harmonic’ designation on this gearbox is a little of a misnomer, since the defining feature of a harmonic drive seems to be the periodic deformation of a flex spline, as we saw in this 3D-printed strain wave gear. But we see the resemblance to a harmonic drive, and we’ll admit this beastie is a little hard to hang a name tag on. Whatever you call it, it’s pretty cool and could be a handy tool for all kinds of builds. Here’s a short film made by the Hammond Organ Company with the intent to educate and persuade potential consumers. Right away we are assured that Hammond organs are the cream of the crop for two simple reasons: the tone generator that gives them that unique Hammond sound, and the great care taken at every step of their construction. Hammond organs have ninety-one individual electromagnetic tone wheel assemblies. Each of these generate a specific frequency based on the waviness of a spinning disk’s edge and the speed at which it is rotated in front of an electromagnet. By using the drawbars to stack up harmonics, an organist can build lush walls of sound. No cost is spared in Hammond’s tireless pursuit of excellence. All transformers are wound in-house and then sealed in wax to make them impervious to moisture. Each tone wheel is cut to exacting tolerances, cross-checked, and verified by an audio specialist. The assembly and fine tuning of the tone generators is so carefully performed that Hammond alleges they’ll never need tuning again. This level of attention isn’t limited to the guts of the instrument. No, the cabinetry department is just as meticulous. Only the highest-quality lumber is carefully dried, cut, sanded, and lacquered by hand, then rubbed to a high shine. Before it leaves the shop, every Hammond organ is subject to rigorous inspection and a performance test in a soundproofed room. We touched on harmonic table MIDI controllers when [aris] was building one. [Ken Rushton] has one of C-Thru’s commercial keypads, the AXiS-49, and disassembled the device to show how it works. A PIC18F2450 microcontroller provides the USB interface and is connected to a dsPIC33FJ128GP310 digital signal controller which decodes the keypresses. The membrane buttons are made with two concentric graphite disks that touch gold contacts. The microcontroller measures the time between the two points contacting to determine the button velocity. monome button clones also use circular contact pads, but cannot calculate velocity because they only have one element.